Concept SL-200 Solar Powered Outdoor Flood Light features bright LEDs in a compact, attractive design. Great for outdoor illumination of walkways, patios and backyards. It is engineered for outdoor weather and can be easily installed in various configurations with minimal tools or effort. You don't need to wire anything or involve electricity - The Power Comes from the Sun. SL-200 Features: 44 Super Bright Wide-Angle LEDs, 2W Pol-Crystal Solar Panel with 11.6’ cable for positioning in a sunny location, 4V 4.5AH Lead Acid Battery(included), 360 Lumens,Brightness is Equivalent to 15W CFL, Coverage is approx. 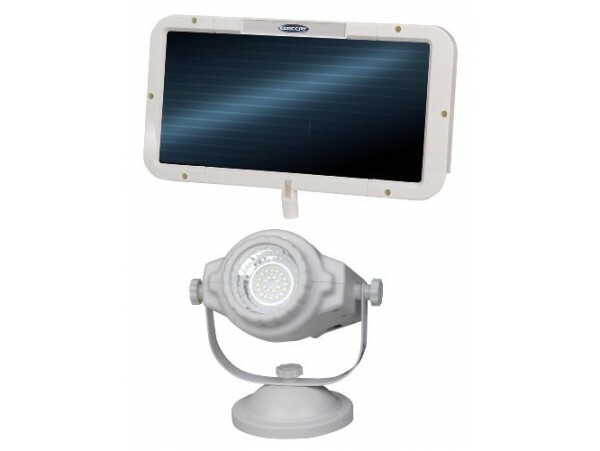 600 sq ft, lasts up to 8 Hours on Full Charge, Photocell Light Sensor with Manual On/Off (Extended Cable Included) Designed for outdoor use, the SL-200 solar-powered LED flood light offers a convenient way to light up a side yard, highlight a patio, or increase safety around an alley, doorway, or garage. Its wire-free design means no need for electricity, making it an especially handy option for remote or difficult-to-access locations such as rooftops, sheds, detached garages, barns, and other outbuildings. In lieu of electricity, the ultra-efficient unit draws energy from the sun using a solar panel. The unit turns on automatically at dusk, Even more, the compact unit provides a separate on/off switch with an extended cable and features weather and impact-resistant plastic construction for long-lasting performance and defense against the elements. A practical addition to any outdoor security system, the solar flood light measures 8-8/9 inches long by 9-3/5 inches wide by 14-3/5 inches high. Decades of engineering experience and expertise birthed a complete line of solar lighting systems-from outdoor motion-sensing security lights, flood lights, decorative lanterns and bollard lights-that bring warmth, ambience, and a sense of safety to rural and urban homes.